Jesus Christ ordered one of his Marines to regroup in Heaven on 29 July 2018. Jerry was predeceased by his father and mother, Arnold and Martha, Brothers Wayne, Harold and Glenn. Surviving him are two daughters, Amber and Amy, along with wonderful grandchildren. Also, one sister, Ruth. He was a member of the Operating Engineers and worked on many projects. 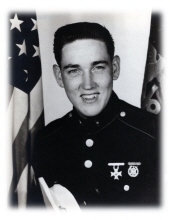 As a United States Marine, he was deployed to Vietnam and later served as a marksmanship instructor at Quantico. Funeral service will be 2:00pm Sunday August 5, 2018 at Ellison Funeral Home Chapel with Rev. Doyle Lester officiating. Visitation will be Sunday August 5, 2018 at Ellison Funeral Home Chapel from 12:00pm until the funeral hour. Interment will follow in the Highland Cemetery. To send flowers or a remembrance gift to the family of Jerry Evans, please visit our Tribute Store. "Email Address" would like to share the life celebration of Jerry Evans. Click on the "link" to go to share a favorite memory or leave a condolence message for the family.